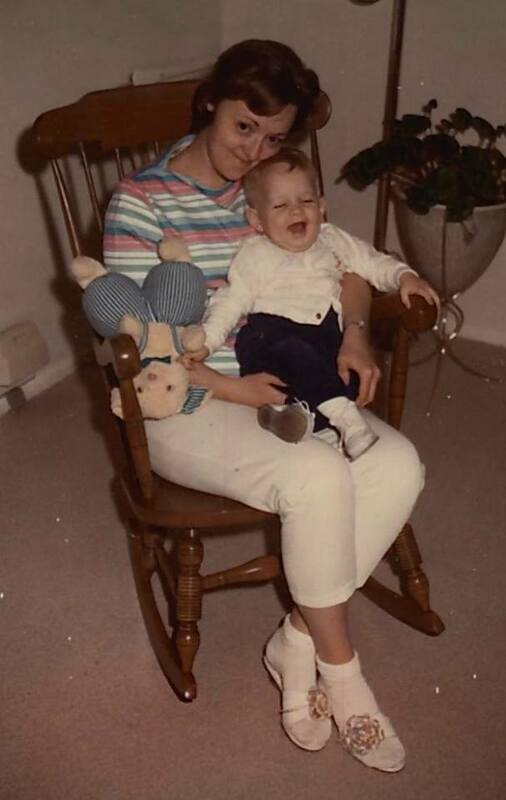 Me and my mother, circa 1964. My mother’s last words to me weren’t words, but a wan smile and wave. She was propped upright in bed by an armada of fluffy pillows tucked inside starched white slipcases. Her blue, flannel nightgown was a hand-me-down from her own mother; she loved it so. It was as crisp as the slipcases. The hospice workers changed her bed sheets every four hours to keep her comfortable because my mother loved the smell and feel of laundered linen. She looked like a used toy nestled in a new package. I had flown home to sit by her bedside when she was awake and tidy up her affairs when she wasn’t, which was often. A few days earlier, in a long and tense phone call with my uncle, I had agreed with him that she would never leave the hospice, and that the clean sheets and pain medication were the only things left to offer. This was a frequent refrain. For months, my mother seemed on the edge of the abyss, then I would visit and she would pull back, just not far enough to get her out of hospice. I had mounted each trip to see her as if it were my last. When I arrived straight from the airport, she was sleeping so deeply not even the hospice workers could rouse her. A desert breeze wafted through open windows to freshen her small room. She slept through the first day of my four-day visit and the second. On the third, she was awake when I arrived in the morning. We talked – rather, she talked, and I tried to make sense of what she was saying. Much of it seemed to be about her upbringing in Utah and Hawaii, about her own uncles and aunts and cousins I never met, about events that occurred more than generation before I entered the world. The whole time she talked, I was one of those uncles or cousins. She spoke as if I had been a witness to each event she recounted. At each, a knot formed in my chest. The fourth and final day of my visit started like the first two. My mother was deep asleep and stayed that way past noon. Attendants bathed her and changed her bedclothes, yet she did not stir. My time with her was trickling away. I looked around the room at the few belongings she had left – a framed watercolor that once hung in my grandmother’s house; pictures of my uncle’s children and a 20-year-old picture of me; a gray, stuffed cat that resembled her real cat, which she had to give up upon entering hospice. I bought the stuffed cat when she began spending more time in hospitals than at home. At last, an hour before my flight was due to leave, she opened her eyes and stared at me. No words, just a long stare from eyes that were tired and dark and dull. I tried spurring conversation by recalling pieces of the broken stories she had strewn across her mind. I pointed to and described the watercolor, the family pictures, the cat. Finally, I rose to leave and leaned over to kiss her forehead. Her skin was smooth and cool. Her white hair was pushed against the pillow. I pressed her knotty hand into mine. I headed toward the door, and as I opened it to leave I turned around to wave goodbye. She had raised her hand slowly to wave back, grasping at the air as if reaching for a knob. The sagging corners of her mouth turned up and her lips formed a slight smile. For a moment, my mother’s eyes also appeared to brighten. I have thought of that moment each Mother’s Day since. I probably will remember it each Mother’s Day hereafter, and I wish I had swept up and bundled as many better memories of her that I could summon. But the smile and wave told me more than all she had tried to say in words. For in that instant, I believe she remembered who I was, why I was there, and what I meant to her. And there were no words that could express those things any better. David, thanks for sharing this. Your story helps all of us treasure each day we spend with our loved ones.